I'm inclined to think cereal boxes can be used for pretty much everything. Today, ours became post cards, letter booklets, and mailing envelopes. At top, our envelope with mailing label attached to the front and two post cards my kids wrote to their grandparents (be surprised, Mom). Above, the backs of the post cards and a booklet made from sandwiching cereal box with white cardstock (I like to machine stitch them together). I thought it could be a short recount of our visit to the sculpture park, but as we haven't done that yet, I stuck in a picture of the baby (using my new circle cutter!). Hopefully, later, the kids will fill it in with writing, drawings, and more photos. 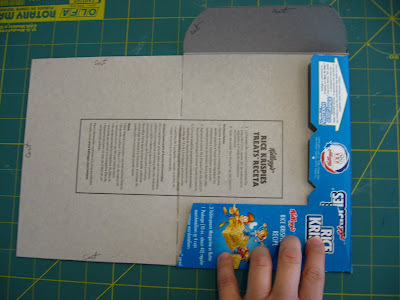 Below are the basics for making an envelope from a cereal box. I LOVE this project! The bright colors are great. Brilliant ideas! I agree that the graphics on packaging are often so appealing, why not look for ways to reuse them? And I'll be watching my mailbox....for a surprise, of course. Wonderful idea. We use our cereal boxes as paint canvases. Thanks for sharing. We will certainly be making cereal box postcards. Great project - nice recycling! Plus it is always fun to send and get mail, how creative! I've been trying to come up with a cheaper way to mail the cards from my etsy shop. This is perfect and so much more fun! But AAAAHHHH I just threw out my cereal boxes yesterday. LOVE THIS!!! 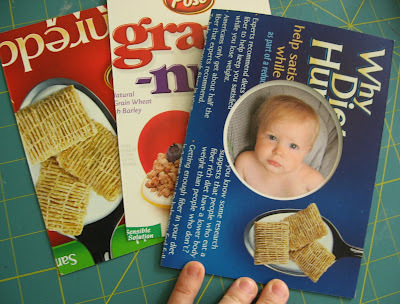 I save cereal boxes but have never thought of THIS...Sheesh so easy but awesome! Oh goodness! My littles are going to LOVE sending out their cereal postcards! But then everyone will know how many cheerios we eat! BTW, I host a "blog carnival" about green crafting, the next issue will be posted at craftingagreenworld.com. I'd love to link to this post! Not republish it, just link to it and recommend that people check it out. Please let me know if that's ok with you. Email me at greencraftscarnival at gmail dot com if you get a chance. Love it! 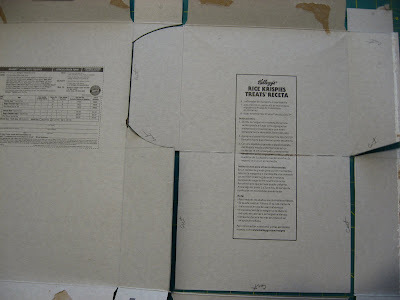 I'm looking at my cereal boxes in whole new way! 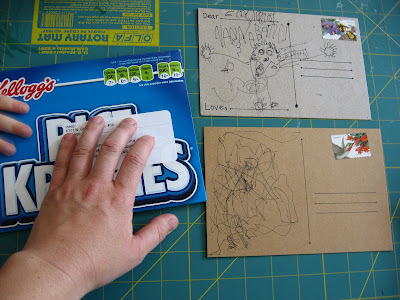 I have use ceral boxs for patterns for years ,love this tutorial so fresh and new! What a wonderful idea and such a fantastic recycled craft project too. I love the post and thanks for sharing your green crafting ideas.